It's that time of year to celebrate all things spooky, as Halloween lovers share ghost stories, tour haunted homes and don frightful costumes. 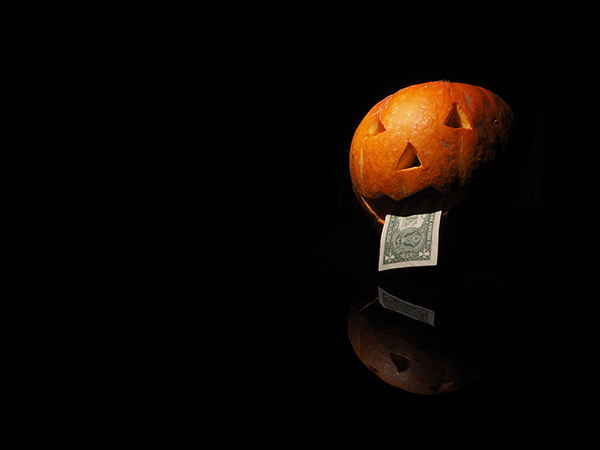 But on Wall Street, spooky talk isn't confined to October. Traders and bankers often employ a number of eerie terms throughout the year. Read on to learn a few...if you dare! Dead Cat Bounce: When a black cat crosses your path, it might mean bad luck. But when a dead cat bounce is before you, it might mean something good, albeit very fleeting: a temporary rise in share prices. One of the more grisly terms used by investment pros, a dead cat bounce refers to the momentary jump in the price of a stock after a major decline. The phrase originates “from the facetious notion that even a dead cat would bounce slightly if dropped from a sufficient height,” according to Merriam-Webster. Death Play: A rather insensitive term in Wall Street's lexicon, a death play refers to the strategy of buying or short-selling a stock with the expectation that the move will prove lucrative should a company executive die. Investors who believe a sick CEO's death, for instance, would be devastating to a company's performance may decide to short a stock, where another, who thinks the subsequent change of management would be a good thing, might buy. Ghosting: Those who dress as ghosts for Halloween might cover themselves in bed sheets from head to toe, but those who participate in ghosting schemes on Wall Street engage in an entirely different cover up. Ghosting describes collusion between firms that try to illegally (and secretly) manipulate a stock's price for their own benefit. Graveyard Market: Contrary to what the name might imply, a graveyard market is not a market for trading graveyards. Instead, it refers to bear markets in which investors can't sell their holdings without suffering large losses while other investors, wary of the bear market, decide not to invest at all. As Barron's Dictionary of Finance and Investment Terms explains, "Like a graveyard, those who are in can't get out and those who are out have no desire to get in." Phantom Stock: One of the definitions of the word "phantom," according to the Cambridge Dictionary, is "something that appears or seems to exist but is not real or imagined." That doesn't mean, however, that phantom stocks are imaginary stocks. It’s a little more complicated than that. This term refers to a form of employee or executive compensation that is related to the value or performance of an employer's stock, but differs from conventional equity compensation. As the National Center for Employee Ownership explains, phantom stock is "simply a promise to pay a bonus in the form of the equivalent of either the value of company shares or the increase in that value over a period of time." That bonus may be paid out in cash or stock at a predetermined date, but an employee receives no stock at the outset, when he or she is initially enrolled in a phantom stock plan. Witching: You may be forgiven for wondering if some sorceress had, indeed, cast a spell on the markets on the third Friday of every month, when many future and options contracts are set to expire. The raft of expirations tends to spur high volumes of trading and these periods are known as "double witching," "triple witching" and "quadruple witching," depending on how many types contracts—stock options, stock futures, index options or index futures—are set to expire. Zombie Banks or Zombie Companies: These morbid terms describe companies that are insolvent and yet are somehow able to keep operating. The phrase was used widely during Japan's so-called "lost decade" when, in the 1990s, the country helped some unprofitable firms stay alive through bailouts and guarantees. Many companies that should have been liquidated were "too complex and costly for their lenders to shut down," The Financial Times explains. "Hence they remained half-alive, poisoning the corporate world by silently spreading a sense of stagnation and fear." On the bright side, unlike their eponyms, zombie companies didn't munch on anyone's brains—at least, not that we know of.